THE HOUSE OF THE DEVIL: The Night Of The Outside-In Homage – Schlockmania! Homage is a horror filmmaker’s best friend. Any genre effort is going to be judged by its predecessors no matter what, especially one with a devoted fan following like the horror genre, so why not use it to one’s advantage? Smart horror filmmakers can use the tool of homage to manipulate the expectations of their audience, fulfilling some and skirting others to keep the viewers on their toes as the film leads them into new areas within familiar territory. That said, the use of homage must done with careful thought and insight. If not, a filmmaker runs the risk of reminding the audience why a film’s predecessors were so good and making their own work look like a poor relation. And that brings us to The House Of The Devil. From the retro opening titles and the Cars-esque new wave our heroine is listening to, writer/director Ti West is placing us in the 1980’s. Our lead/identification figure is Samantha (Jocelin Donahue), a college student who is trying to escape the dorms and get an apartment. Unfortunately, she only has a few days to get the necessary cash. 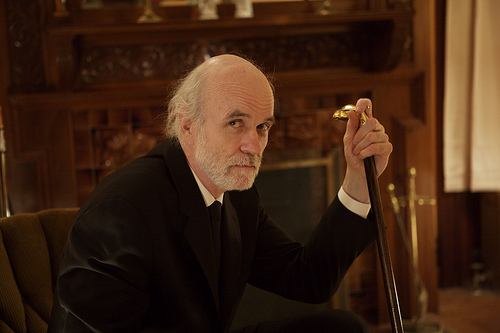 Potential salvation arrives in the form of the Ulmans (Tom Noonan & Mary Woronov), a couple who offer a babysitting gig. Best pal Megan (Greta Gerwig) advises Sam to stay away because the Ulmans are weird and deceptive but Samantha is convinced she can tough it out. Of course, this is a big mistake. There’s something desperately wrong with the situation and sinister forces will conspire to make Samantha regret her decision in ways she never dreamt of. On the surface, this should work like a dream. West helms his tale in a deliberately paced, quietly atmospheric style that is refreshing in this post-Saw era. The performances all work: Donahue underplays nicely, Gerwig steals her few scenes as the charmingly obnoxious friend and Noonan and Woronov beef up the creep factor of their characters with a mixture of their naturally sinister charisma and fun, Method-style acting mannerisms. Eliot Rockett’s cinematography nails that grainy, shadowy style beloved to slasher movie fans and the musical score avoids typical cliches for a set of unnerving sonic textures. However, The House Of The Devil fails to satisfy. The main culprit is West’s script: simply put, it’s a mess. The character of Samantha is a written as a complete dimwit and her trials never open up her character in a way that inspires sympathy or audience identification. The Ulmers are written so broadly that we never get to question whether or not their intent is sinister. The second act just leaves Samantha in the house and doesn’t introduce any interesting twists or new plot elements, resulting in a depressingly slack midsection. The third act revels in blood and shocks but its gonzo approach is too abrupt a tonal shift from what preceded it. Even worse, it requires the villains to suddenly act in incredibly dumb and incompetent ways. The coda offers a rather incoherent final twist that ends things with a groan. It’s as if West brainstormed a variety of retro horror elements that he wanted to explore and rushed into production before the story was worked out. It is obvious that he’s having a blast behind the camera, bouncing from motif to motif like a pinball, but he forgot that it all needs to add up at the end. There’s no archetypal themes or psychology driving his story forward and no emotion to draw us into its world. The blood-and-thunder finale it reaches feels like a distraction, an attempt to jolt the viewer out of noticing its inability to make the story pay off (even the film’s defenders admit said finale is the least successful part of the film). As it result it feels gratuitous – not because of the content, but because West and his story have not earned such an ending. The best horror movies are made by people who want to give you a piece of their mind, a piece of their tormented soul or a little of both. It feels like West doesn’t want to offer the viewer anything but a bunch of references and mood. 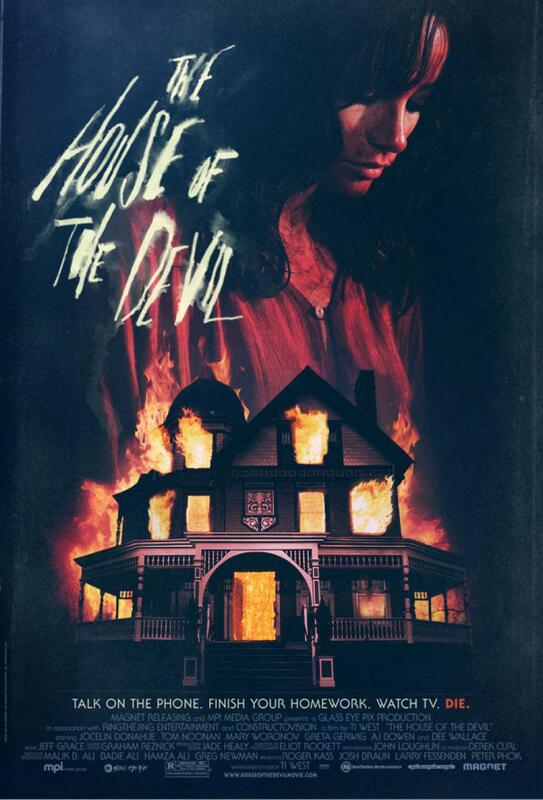 The House Of The Devil undertakes its homage process from the outside in, getting the external particulars right without ever inhabiting them. It’s just not enough to know the look and style, a horror film also needs a brain and a pulse. Unfortunately, all there is here is freeze-dried homage that leaves lingering thoughts of older, better and more intellectually/emotionally rich horror movies. Previous ArticleSchlock-Wire: Esoteric Recordings’ Mar/Apr Slate – PFM, Arthur Brown And More!